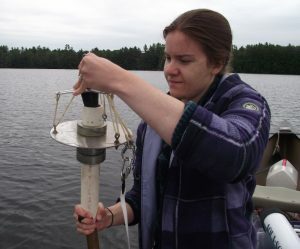 In the last several years, LEA has augmented its traditional lake sampling program to incorporate new and advanced tests and monitoring techniques. These initiatives are a result of knowledge gained from partnerships that we have developed while working toward Maine Lake Science Center goals. Below is a brief summary of some these recent initiatives. Lake monitoring and research support healthy land and water and underpin efforts to stabilize, improve, and restore water quality. Educating students and the public builds environmental ethics and practices. LEA strives to help strengthen community organizations, integrate infrastructure with natural landscapes, and help communities adapt and respond to climate change. In collaboration with other organizations, LEA has developed a working model approach: the Maine Lake Protection and Research Collaborative. The Collaborative engages a multi-disciplinary community of academic researchers, state and federal agency staff, and non-government organizations to collaborate with the common purpose of identifying ‘needs and barriers’ for the protection of Maine’s precious lakes. One of the first priorities under the Collaborative focused on establishing regional hubs to provide training and resources to empower lake organizations to increase monitoring and program capacity. To do this LEA worked with grant funders to create, provide, and distribute “monitoring packages” that allow for expanded research at regional hubs and lake associations that have staff capacity. Packages were developed based on expressed needs and desires of individual organizations with input from a coalition of large lake associations in the state. Packages were developed for 7 Lakes Alliance (formally the Belgrade Regional Conservation Alliance), the Midcoast Conservancy, the Lake Stewards of Maine (formally Volunteer Lake Monitoring Program), the Rangeley Lakes Heritage Trust, 30 Mile River Watershed Association, and the Cobbossee Watershed District. To help better understand and document algae and nutrient concentrations in the state, LEA added in-house lab fluorometry and spectrophotometry to the Science Center lab with foundation funding. Our research director is using these instruments to compare field and lab chlorophyll data and to develop calibration curves to compare results from the two methods. Analyzing chlorophyll fluorometrically can significantly reduce long-term lab costs. This was identified from past research retreats as a need in the state and a priority for the Collaborative. To help increase monitoring and education about blue green algae blooms, the MLSC has been hosting cyanobacteria (blue-green algae) workshops with EPA region one scientist Hilary Snook. 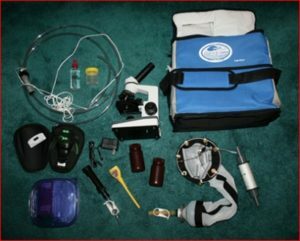 Following training sessions, monitoring kits are offered to participants to allow them to institute their own cyanobacteria monitoring. 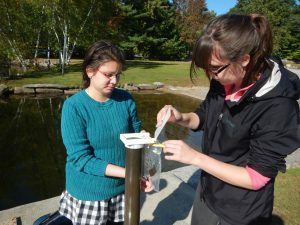 Under the umbrella of the Maine Lake Science Center, LEA has also begun acquiring new information on the chemical, biological and physical processes that occur within lake systems using multi-parameter monitoring probes called Sondes. These instruments acquire geo-referenced data simultaneously on turbidity, pH, oxygen, temperature and algal populations. One initiative we are pursuing with this equipment is to spatially map the surface water quality of lake systems. This project will use a boat-mounted, flow-through system to generate rapid, high intensity measurements of surface conditions all over a lake. Interpolation of these survey data produce snapshots in time of whole lake status. This type of high-resolution, spatial assessment has been done by a few other researchers in the country, but the methodology is still fairly new. Another objective identified through the Collaborative is the need to acquire more high-accuracy depth data (bathymetry) on lakes. Using portable, GPS-enabled, depth mapping units (aka fish finders) we surveyed nine lakes in our region in 2017 and seven so far in 2018. This new data is extremely detailed and will provide an accurate way to quantify the impacts of oxygen depletion and overall susceptibility to internal phosphorus recycling. The project, which is supported by the Maine Community Foundation, continues this summer and LEA will be publishing and sharing the methodology so other lake associations and lake stewards can take on similar work. On the policy and education fronts, we have been working to identify, educate, and inform direct and indirect stakeholders to build support for protection and restoration of Maine lakes. In November of 2017, LEA hosted a Watershed Educator Retreat at the Maine Lake Science Center. At the meeting, educators from around the state shared lesson plans, materials, specific activities, and overall strategies to improve offerings and bolster support for watershed and ecology based programming. Smaller focus workgroups were created to share resources and plan for future meetings in different locations, such as regional lake hubs, to ensure educators from all parts of the state can participate. 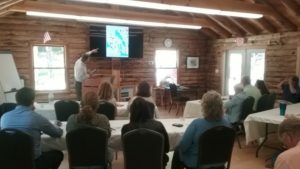 Another multi-organizational education meeting, in collaboration with the Gulf of Maine Research Institute, to connect regional educators with interactive watershed science-based curriculum took place in July. The MLSC offered “Lake School” classes and courses for students and adults interested in expanding their knowledge of lake and watershed systems. Educational and training opportunities took place in 2018, including: a three day course on lake, pond, and stream sampling; a course to build your own water monitoring equipment; an accredited course for real estate agents on lake water quality and property values; and a four-day course for kids to explore nature through hands-on activities at MLSC and Holt Pond Preserve. After piloting programming in our service area, we will export as much as possible to regional hubs and conservation organizations throughout Maine. We plan to continue and expand offerings next summer. The MLSC policy team is developing physical and social science-based public policy to encourage behavior change in order to implement the initiatives needed to sustain lake resources and services. This past winter, a steering committee was formed to convene a series of workshops aimed at developing or revising land use standards needed to bring lake protection up to date. Workshops were held at the three regional hubs and Maine Audubon. 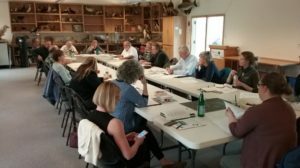 These involved lake advocates, staff from several agencies, lake association personnel, municipal officials, and the general public – many with extensive expertise in land use policy. The emphasis was on developing new standards that will allow policy makers and advocates to choose from a “menu” of options to customize management of individual lakes or lake regions. The effort going forward will be to educate and involve myriad groups and individuals to create the political force necessary to successfully enact proposals to achieve our ultimate goal of protecting Maine lakes for future generations. We are also taking on initiatives at a watershed level. One of these projects is a new digital approach to erosion surveying, which helps assess the impact of climate change on stormwater infrastructure. The new method we are pioneering requires only one or two surveyors and a smartphone. Data entry, compilation, and analysis are fully automated. This method of surveying has great potential for the environment and public works departments. The functionality of a live, searchable map and a dynamic database make the product user-friendly. With foundation help, LEA developed a detailed handbook so other towns and lake organizations can easily replicate the process. 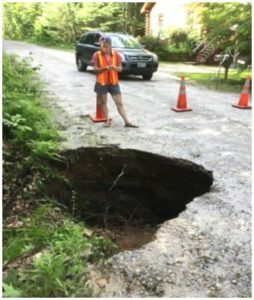 Being able to track stormwater infrastructure problems is very important since most sediments and nutrients reaching lakes come from stormwater runoff. The handbook is available at https://mainelakes.org/stormwater_survey/, and we have developed an exportable survey that is ready for immediate use. Gloeotrichia echinulate monitoring. This species of algae is a type of cyanobacteria that dominates some low-nutrient lake systems in late July and early August. It is able to thrive despite low nutrient levels because it collects phosphorus from sediments before entering the water column. MLSC and LEA staff have been collaborating with Dr. Holly Ewing of Bates College in Lewiston, Maine on much of this research in the Lake Region. Temperature is one of the most fundamental and important characteristics of a lake ecosystem. Tremendous amounts of temperature data have been collected in several lakes using automated temperature sensors. Sensors are attached to a floating line at the deepest part of the lake, each collecting readings at a discrete depth every fifteen minutes throughout the spring, summer, and fall. Algae are the basis of lake food webs. These microscopic plants can tell us a great deal about how a lake is functioning. Through assistance from the Portland Water District and the Bigelow Laboratory for Ocean Sciences, we have developed an algae monitoring program that identifies and counts each algae present in pelagic water samples. The MLSC and LEA staff have made significant progress on expanding enhanced monitoring efforts. 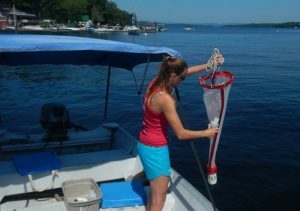 LEA staff researcher, Amanda Pratt, has increased algae monitoring work to cover new lakes and she increased the number of samples taken during the season to better understand population dynamics. Highland Lake and the North basin of Long Lake are home to automated water monitoring buoys, which measure temperature, oxygen, clarity, chlorophyll, and weather levels every 15 minutes at the lake’s deepest point. The buoys are part of the Global Lake Ecology Observation Network (GLEON) network, a collection of lake monitoring sites located all over the world. Dr. Whitney King of Colby College has been instrumental to this project through his support and guidance. The deployment of the buoys is an effort to gather significant data and better understand how vulnerable our lakes are to algae blooms. 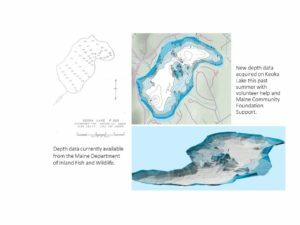 In an effort to broaden our research and share data, MLSC Research Director Dr. Ben Peierls attended the most recent GLEON meeting in November 2017 at Mohonk Lake in New York. There he met researchers just beginning work in Maine and teamed up with a subset of fellow researchers from around the globe to study the effects of climate change on winter lake dynamics. Sediment chemistry, in particular aluminum to iron and aluminum to phosphorus ratios, can predict whether or not a lake will experience internal phosphorus recycling. This detrimental process releases stored phosphorus from sediments, fueling algae growth and creating a destructive positive feedback loop in lakes with hypolimnetic (deep water) oxygen depletion. Drs. Stephen Norton and Aria Amirbahman of the University of Maine, Orono (UMO) were part of the group of researchers who first discovered this phenomenon. To better understand the influence of these element ratios in our region, LEA sampled sediment from many local lakes and had it run at the UMO Sawyer Lab under the guidance of Dr. Jasmine Saros. At the same time, Highland Lake and Long Lake were the subjects of a paleolimnological sediment study. This study analyzed changes in the sediment diatom record going back about 400 years. Analysis was carried out through collaboration with Dr. Jasmine Saros and researchers from the Climate Change Institute at the University of Maine.